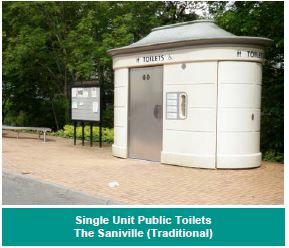 Stanton Bonna adds public toilets to portfolio! Stanton Bonna is part of the Consolis Group, Europe’s largest precast concrete producer, and is widely recognised as a leading UK manufacturer of concrete Drainage Systems, Pressure Systems, Railway Products and Specialist Precast solutions. The company manufactures for the water, highways, rail, housing, telecom and power sectors of the construction industry. Francioli is also part of the Consolis Group and are experts in Public Conveniences and Street Furniture. They have been successfully manufacturing and supplying these products throughout Europe for over 40 years. Stanton Bonna Concrete Limited is the UK arm of Consolis and so now represents Francioli Public Toilets in the UK. There are over 2,650 Francioli public toilets currently in service, including UK sites from Scotland to Cornwall. Francioli modern designs provide an attractive and durable solution with state-of-the-art systems. They are protected against vandalism and easy to maintain with semi-automated cleaning facilities and remote maintenance. The hardy exterior ensures it can withstand all weather conditions and comes in a variety of finishes to harmonise with the surrounding environment. 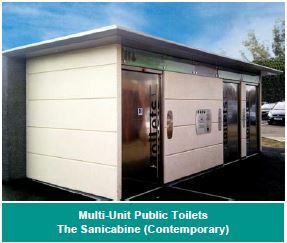 The range includes traditional and contemporary single units, modern multi-unit systems, the innovative box-in-box system for upgrading existing buildings and specialist public toilets adapted to the needs of the project, for example travelers sites or lorry parks.